Pumpkin chocolate chip cookies, small batch for two. Recipe makes just 9 cookies! I checked with the food gods to see if it would be okay if I started sharing this year’s best pumpkin recipes. Good news: they said yes. The bad news is, though, that you will eat this entire small batch of pumpkin chocolate chip cookies by yourself. In one sitting. I mean, if you’re anything like me and lack self-control. They’re soft, chewy and spicy, and I couldn’t get over how easy they were to stir together. 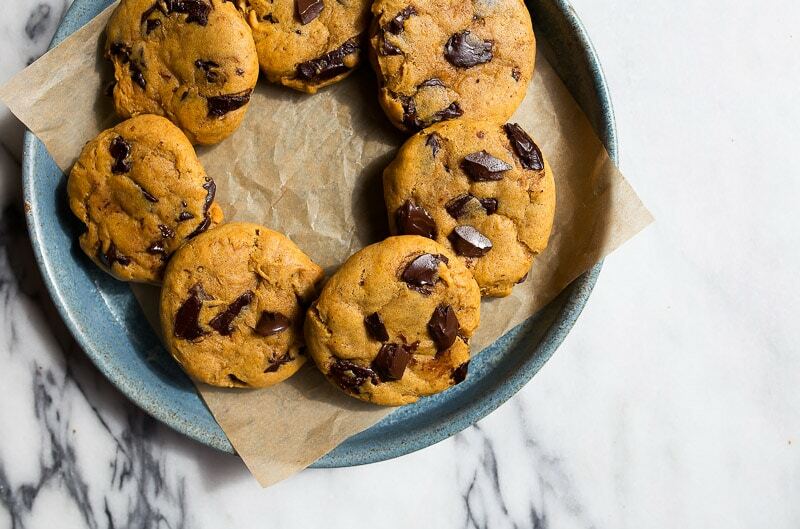 Two is the number of cookies you’ll eat right out of the oven. Seven is the number of cookies you’ll say this recipe makes when you offer to share them with your honey. I based this small batch cookie recipe off of Sally’s recipe for Pumpkin Chocolate Chip Cookies, and if you know anything about Sally (you do know about Sally right? She’s the baking queen of the internet), you know it’s going to be good. Sally’s the chick I go to when I’m having trouble scaling down a recipe. She knows all the tips and tricks about what makes baked goods exactly the way they’re supposed to be. She’ll help you get soft, chewy cookies with crisp edges, thanks to melted butter, a brief chill time, and a lack of eggs. I kinda love Sally a lot. (A lot a lot). I met her about a year ago, and WOW. I mean, not only is she just as pretty in person as you would imagine, she’s also super kind, sweet and smart. Sally is my girl. She also just announced a few days ago that she’s working on her third cookbook that’s all about, you guessed it, COOKIES. So, naturally, I think we should all swan dive into allllllll of the cookie recipes on her site, and bake them all before she gets ready to give us 75 new ones. 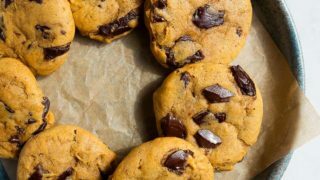 Is this just my regular small batch chocolate chip cookies recipe with pumpkin stirred in? Well, kind of, but it’s been refined a bit because pumpkin puree brings so much moisture to the cookies and can make them overly soft. Reducing the quantity of butter helped with this problem. The benefit, though, is that the pumpkin takes place of the eggs, making these pumpkin cookies without eggs great for allergy-friendly cooking. I also added a full teaspoon of pumpkin pie spice to the recipe for a few reasons. One, warm spices and chocolate go together so very well! And two, a full teaspoon of pumpkin pie spice in just 9 cookies brings A LOT of flavor. I recommend chocolate chunks, or a chopped chocolate bar. Chocolate chips don’t melt as easily in the oven, but soft gooey chopped chocolate chunks do! It’s completely your choice, though! This recipe doesn’t contain any eggs! 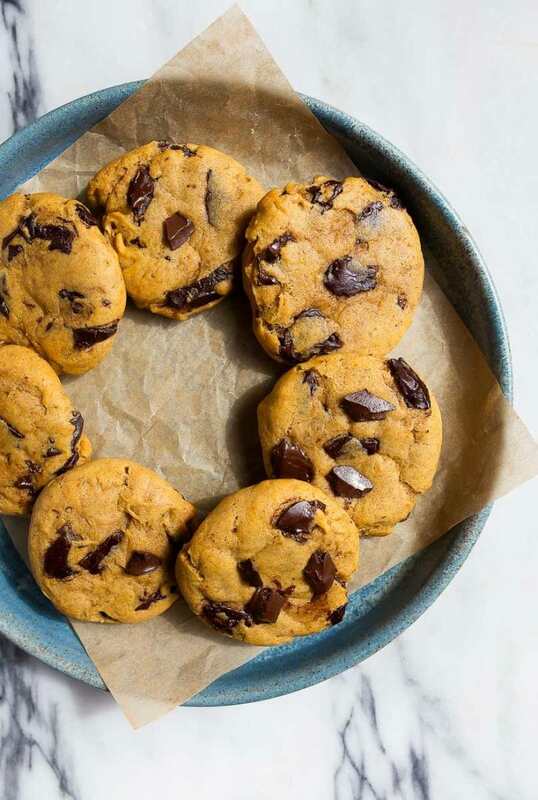 So, if you’re looking to make pumpkin cookies without eggs, then this easy pumpkin choc chip cookies is your best bet! Have I convinced you to make these yet? It’s only 9 cookies; you can do it! Go get yourself a pumpkin spice latte, make a small batch of pumpkin chocolate chip cookies, and enjoy the season that’s coming soon! Line a cookie sheet with parchment paper (or a silicone mat). In a medium bowl, whisk together the melted butter, brown sugar, granulated sugar, vanilla, and pumpkin. Evenly sprinkle the flour, salt and pumpkin pie spice on top. Use a spatula to fold everything together, and then fold in the chocolate chips. Place the cookie dough in the fridge for 30 minutes. Meanwhile, preheat the oven to 350. Press the dough flat in the bowl, and then divide it in half by eye into 4 quarters. Make 2-3 cookies from each quarter. Roll them into balls, flatten with your palm, and then bake for 9-10 minutes. Let the cookies cool for 2 minutes on the baking sheet, and then move to a cooling rack before devouring completely. I’ll probably just pretend this recipe make 3 cookies. And I am so kind and generous that I will give them all to my husband. So selfless, right? Seriously, I love how beautifully orange these are! Mmm these look so moist and chewy!! Love the flavour! I just happen to have a little bit of pumpkin left after making pumpkin pancakes. I feel like these cookies were meant to be! I can’t wait to give them a try tonight. I have a can of pumpkin I’ve been needing to use. These are getting made to.night. These cookies look delicious. They also look so perfect. Do you place extra choc chunks on top before you bake them? My choc chips always seem to get buried in the dough when I make cookies. I can’t wait to try this recipe. Thanks for sharing. YAYAYAYAY! A mashup for the ages. Love pumpkin and chocolate, so these cookies sound about perfect to me. I just made them and didn’t put in the fridge. They turned out ok, but make sure you flatten them out, these cookies don’t spread out. But very good cookie. I like the small batch of cookies, that I can just whip up for my hubby. These were delicious! I ate 5, my husband ate 3 and I’ve been staring at the last one for 20 minutes… so easy too! I recently have come to terms with the fact that indeed, I am gluten intolerant. BOOO, but WOOHOO for people like you who create perfect recipes! I bought gluten free flour & while NOTHING rises with gluten free (HAHAHAAH), the cookies came out beautifully! Since they do not rise, after being cooked, they still resemble raw cookie dough balls, only more smooth. I used vegan chocolate chips from a very small company in Rhode Island (OMIGOSH! SOO GOOD & my husband couldn’t tell the difference). I used Earth Balance vegan butter & other than those changes, I made the recipe as stated. The cookies are so delish! I am definitely filing this one under “make again!! !” Yes, WITH the 3 exclamation points! Thank you Christine for perfectly portioned desserts. I LOVE your site, and I LOVE SALLY! Super excited to make these. You rock! These cookies didn’t really succeed…they were tasty and soft with a good pumpkin flavor, but the insides were almost raw (even after baking for 13min). Since there isn’t any eggs in the batter, it’s still ok to eat. Maybe try again baking longer? Just made these and they’re great — perfect for using up what’s left in a can of pumpkin after other recipes! I added extra cinnamon because I like the flavor with the chocolate and I let them chill in the freezer for a few extra minutes after they were shaped while the oven was preheating. They take did longer to bake for me, but the middles were perfectly cooked after 17 minutes. I made these and they were delicious. My kids wanted more so I’m going to bake a double batch next time. And they’re pumpkin so they’re healthy, right?! We could eat these every day in my home. So yummy.